The onset of autumn is marked by the mega celebrations of Durga Puja. For many the best way to celebrate this 5-day long puja is to visit well decorated pandals of the big spending, theme based Sarbajonin (for Public) pujas. But if you really want to celebrate the Durga Puja as it should be, based on the rituals, a visit to the heritage Pujas is a must. Started at least two centuries ago, these pujas have preserved the true essence and heritage of Durga Puja in their rituals. 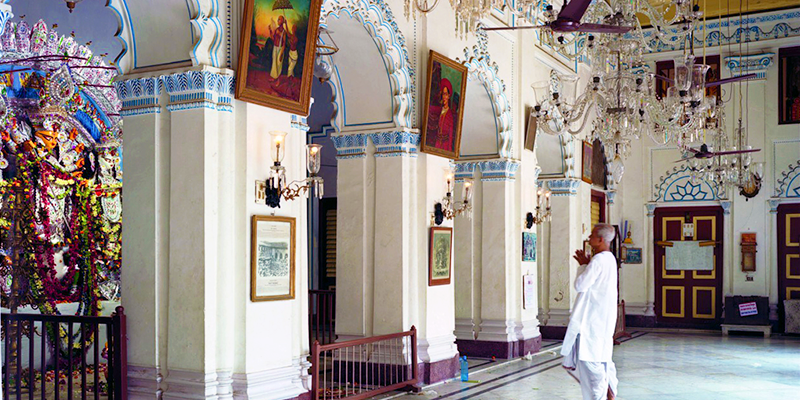 So, if you want a piece of old Kolkata, then a visit to these traditional pujas is a must. Durga Puja was initiated in Kolkata to promote brotherhood and showcase the rich culture of this city, in the pre-independence era. In those days, organizing Durga Pujas was left only to the most affluent class (Zamindars and traders). Common people were not allowed to be part of the celebration in most of these pujas. But, there has been a vast scenario change post Independence. Today, these traditional pujas embrace the commoners and exhibit their preserved customs. Each of the households that are attached with these heritage pujas have an enriched history to tell. So, let’s explore some of the heritage pujas of Kolkata. Counted amongst the famous large scale traditional puja’s, the Mallick Bari’s unique Durga idol is of great significance. In a divine dream Baidyanath (De) Mallick was instructed to worship this Ashtadhaatu (8 metal made) idol, which was kept hidden in a cave in Chittagong (in modern day Bangladesh). Since 1614, Durga Puja is celebrated here, where this Singhabahini idol is embellished with precious jewelry and silver Chalchitra (decorative backdrop). Back in 1757, Raja Nabakrishna Deb started Durga Puja celebrations in Shovabazar Rajbari. Intending to extend a friendly gesture towards Robert Clive, he pioneered the trend of inviting British guests on Durga Puja. Jatras (folk dramas) and local cultural events entertained the huge masses till late night. 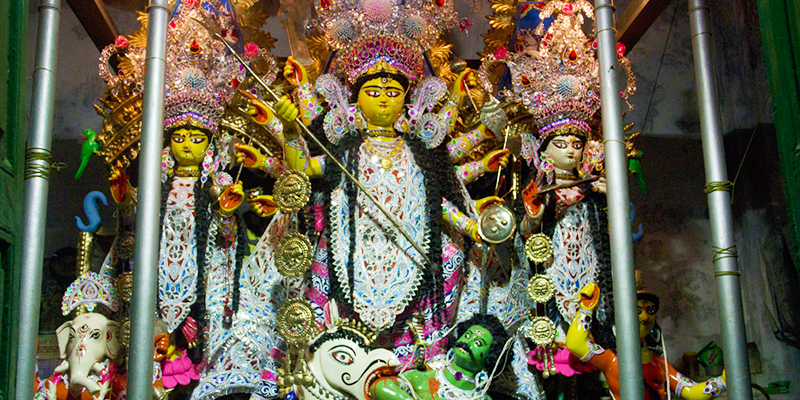 Thus, it is famously believed, the melodious music attracts Ma Durga here. The puja is held in the Thakurdalan (courtyard) surrounded by massive pillars. 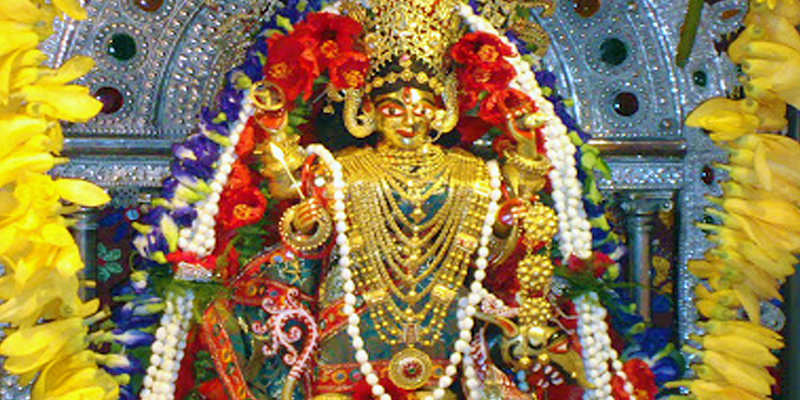 The idol is decorated with gold ornaments and a vast Chalchitra. The Mithai Bhog, served on a large plate of nearly 70 feet diameter, is an attraction of this Puja. 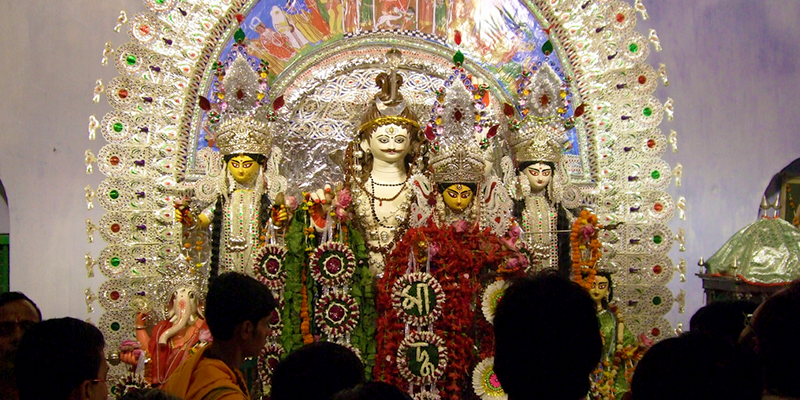 The founder of Dakhineshwar Kali Mandir, Rani Rashmoni initiated this puja in 1780. Legends like Vidyasagar, Raja Ram Mohan Roy, Swami Vivekanada have attended this heritage puja, which was sanctified by Sri Ramakrishna Paramhansa. Retaining all the traditional rituals signified by the Madhusudan Mantra, Kumari Pujo, Durganaam Stotra, etc. makes it a must include in the pandal hopping itinerary. Known for her humbleness, this queen, encouraged jatras and kabigaan (folk song contests) at Natmandir, which is still organised during Durga Puja. Address: 18/3 S.N. Banerjee Road and 18 Rani Rashmoni Road, Kolkata – 700013. Highlights: The sacred Puja bhog is prepared using Ganga Jal and not just any water. This mansion historically dates back to the times of Nawab Siraj –ud- Daulah’s reign, when Durgacharan Mitra served as his court jeweler. His successor, Radhakrishna Mitra set off Puja celebrations in 1807. Ma Durga’s elegance is doubled with the Techala Chalchitra (3 storey backdrop) and the lavish throne she is seated on. Interestingly Durga’s lion is featured with the head of a horse while the body and mane of a lion. As goes the saying, Ma Durga arrives here to have her food. Highlights: Ma Durga’s lion has the head of a horse; idol is seated on a lavish throne. 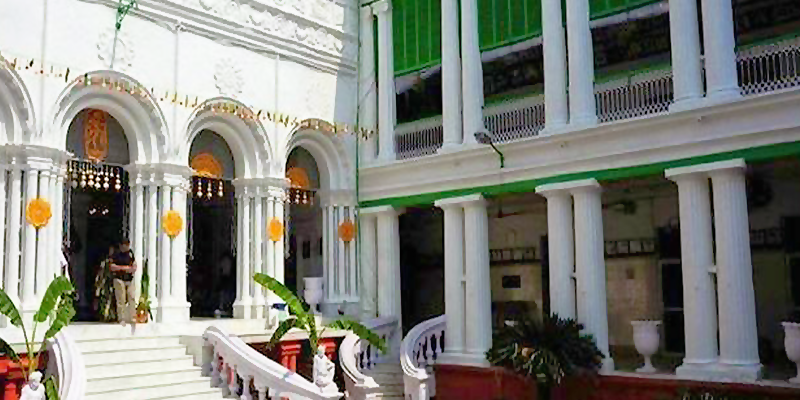 Designed by German architects, the Khelat Bhawan has been celebrating Durga Puja for more than 200 years now. 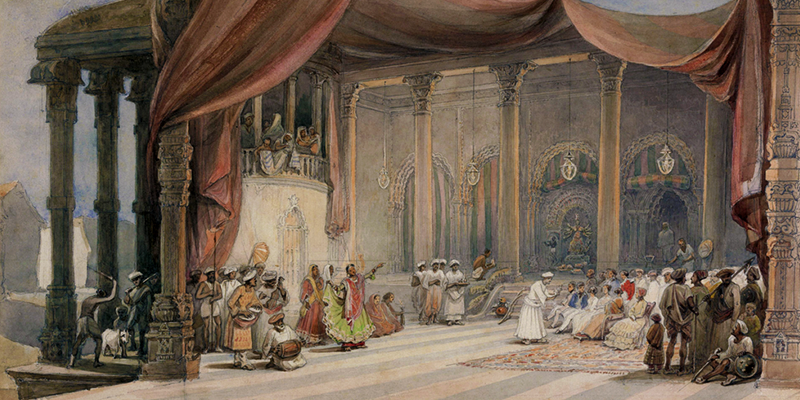 A Diwan in Warren Hasting’s court, Khelatchandra Ghosh was a cultural enthusiast. This heritage building stands tall encircling a massive Thakurdalan. Here the Techala (3–structured) Durga Ma idol is flanked by Kamala and Kamini on either sides. The green Asura adds to the aura of this whole composition. People flock to see the customary gunshots alarming the Sandhikhan on Ashtami. Not to forget the conventional distribution of delicious homemade sweets every Puja. 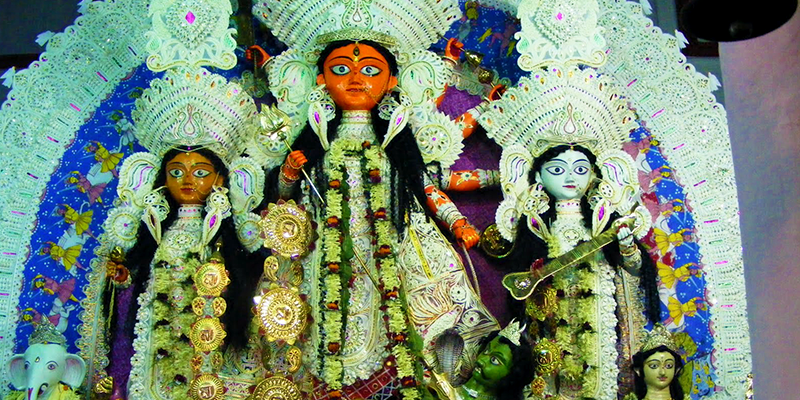 Come Durga Puja and the Dutta Bari echoes with devotees crowding to see the Hara-Gouri idol. Dwarka Nath Dutta, the founder of this puja was an ardent devotee of Shiva. 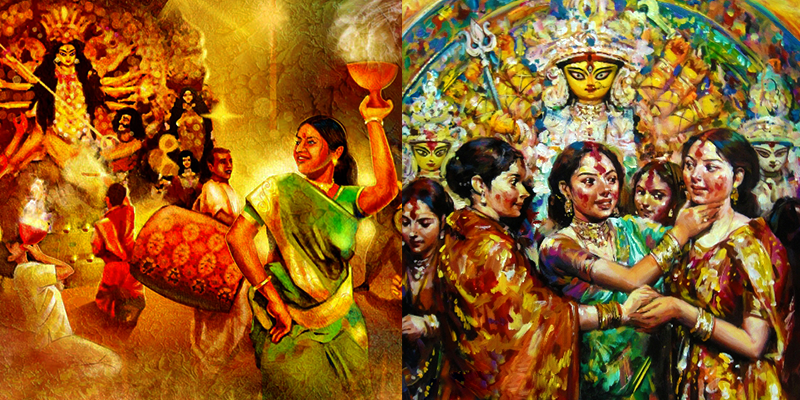 When Hara–Gouri once appeared in his dream, DN Dutta got inspired and started the Durga Puja celebration in 1855. Without any weapons, Ma Durga looks serene here justifying her composed attire. The tradition of dhuno porano is a must watch, wherein married women seeking prosperity and well being, hold burning earthen pots in their palms. While searching for durga puja topic. I found your blog. This is really helpful. Durga puja is not just a festival for kolkata , its an emotion which is attached to every Bengali out there. thank you for sharing such a detailed article about Durga Puja. Durga puja is not just a festival, its more like an emotion with which every Bengali is attached with. Thank you for this lovely article.